103 Windsor Place - Beautifully Renovated Beach Villa with Large Balcony! 103 WINDSOR PLACE – RECENTLY RENOVATED 4 BEDROOM VILLA IN BEAUTIFUL PALMETTO DUNES. The Windsor Place complex is located oceanfront in the famous Palmetto Dunes Plantation. 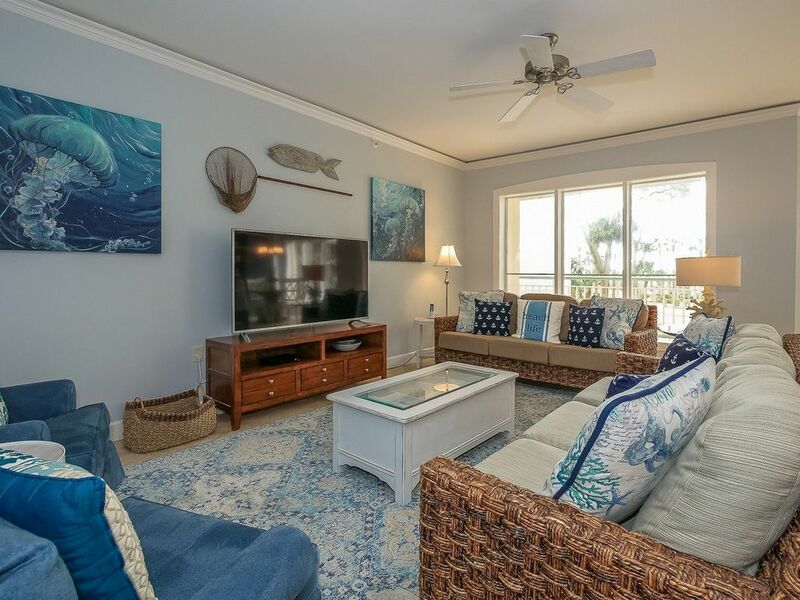 It has two large oceanfront pools (heated seasonally) and hot tub as well as a large sundeck, poolside restrooms, showers and covered pavilion with gas grilling area. One pool is great for children with a graduated entry and mushroom shaped waterfall (opposite end of pool is 4` 6"). Windsor also has elevator access and covered parking garage. This complex has privately owned villas located oceanfront with great views of the ocean, pool or lagoon from any floor. Great place for family time! Linda C.Where do you live? Beautiful condo! Great location! Loved the time with our grown children! We had a great time at the condo. Our family of 6 adults and 2 children had plenty of room. Our favorite part ws the deck. The padded chairs and big table meant we could all eat there and we did breakfast & lunch. The pools were great especially the zero entrance pool for the children. The kitchen was very well stocked with equipment. We hope to return next summer. We really enjoyed our stay. The condo was very spacious and the amenities at the resort were outstanding. Can't wait to plan our next trip!